Author Notes: Here, the season’s first strawberries are soaked in a syrup that’s floral from honey, zesty from lime, and just slightly suggestive of cardamom. Serve them over a lemon-buttermilk sherbet that’s both sharp and sugary, both icy and creamy, for a dish that has the array of flavors and textures (and colors, too) you'd expect as the last course of an expensive tasting menu hong kong weather. The strawberries are barely adapted from Food & Wine, and the sherbert comes from the blog Turntable Kitchen, where it was adapted from Sidewalk Shoes. Put the strawberries in a large heatproof bowl (do not use metal). In a small saucepan, combine the honey and the lime juice and bring to a boil. Stir in the lime zest and the cardamom, remove from the heat, and pour over the strawberries. Stir the strawberries to coat them in the syrup, then let stand, stirring once or twice Hong Kong Cultural Activities, for at least 25 to 30 minutes, until the berries are soft and plump, bathing in a bright red juice. Zest one of the lemons and set aside. Juice both of the lemons and set the juice aside. In a small saucepan, combine the water and sugar. Add in the lemon zest and set over medium heat, stirring until the sugar is dissolved. Pour the mixture into a heatproof bowl and set in the refrigerator until completely chilled. Once the syrup has cooled, whisk in the buttermilk and the reserved lemon juice. Process according to your ice cream maker’s instructions then freeze completely until solid. 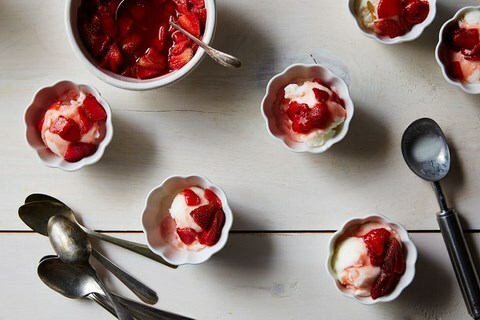 Serve the sherbet with heaping spoonfuls of macerated strawberries overtop Skin Central.